Our Solar Space Heating systems are an excellent and effective way to reduce costly energy bills, they use a renewable energy source during your heating season. For conservatory systems typical annual running costs range from £1 to £5, typical system maintenance costs are £0. The typical parts cost for the system was some £300. Where to have the air holes. 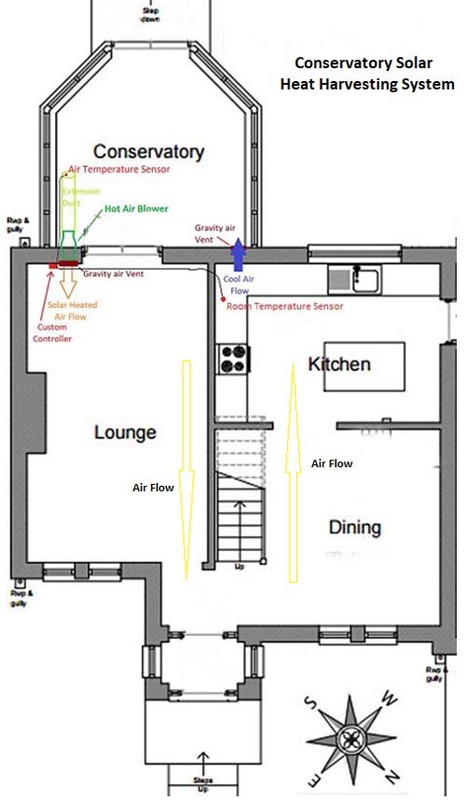 Ideally for Conservatory Heat Harvesting to work most effectively there should be an airflow path from the system fan mounted 'high' in the home wall adjoining your conservatory and pass through your home and return to the conservatory to be re-heated and re-circulated via a second low air hole, which if possible is from a different room. If this is not possible it must be possible for outside air to enter your conservatory when the system is operating through for example a partially open window or a gravity shutter. There should also be a route for the hot air to move through your home, leaving the doors open will permit this, or you may prefer to install a gravity shutter that permits one way air flow from the heated room to other rooms. We have tested many fans to determine those most suitable, our recommendations are based on a number of fan characteristics, one of the most important is the fan efficiency in terms of fan air flow generated per watt of electricity used. Other factors have also been included: maximum fan backpressure; and fan noise. 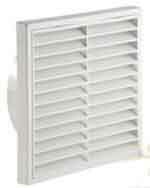 When you have chosen your fan this will determine the size of the air holes and the other parts you will need. a) For small homes (total floor area approx. 70m²) or conservatories (floor area approx. 10m²) we suggest using a 200mm fan e.g. (W1G200-EC87-25) or (W1G200-EC91-45), these fans are quiet and very efficient, however only copes with low back pressure. b) For medium sized homes (total floor area approx. 120m²) or conservatories (floor area approx. 15m²) we suggest using a 200mm fan/blower (W1G200-EC91-45) or a 230mm fan e.g. (W1G230 EB89-01), these fans are a little noisier, a little less efficient but cope with modest back pressure. c) For large homes (total floor area approx. 200m² or more) or conservatories larger than 25m² we suggest using a 230mm diameter (W1G230-EB89-01), or 300 mm diameter (W1G300-BB19-01) fan/blower. These fans are a little noisier, quite efficient, and cope with medium back pressure. Decide on your preferred location for the Attic Heat Harvester Controller. This is generally fitted to a wall in the room adjoining your conservatory beneath the high air hole about 1.5m from the floor making the controller key switches easy to operate and its display easy to see. Another thing to consider is the location of a suitable nearby electrical supply power as it is easier to connect the controller to a 230vac supply. We recommend that the room temperature sensor is fitted in the same room as the return air vent to the conservatory. When you have decided on the location for the high air hole and the other system components you can determine the minimum length of the cables you will require, you will need these to choose the cable lengths to order. Items a) through c) can only be obtained from Solar Heat Harvester. We can also supply items d and e) but you may be able to obtain them less expensively and more conveniently elsewhere. – please read and understand these before you start work. 1 On both sides of the wall between the conservatory and your home decide on and carefully check the desired position of the high conservatory hot air exit hole, take care to consider the position of window and door lintels because they project into the supporting wall, the air holes must not be there. 2 Locate the position of the low conservatory cool air return hole if there is to be one. The air return hole should preferably be quite a distance from the first hole and close to the floor. 3 When you are confident that your desired hole positions are good, drill a small diameter 'checking' centre hole through the wall that is perpendicular to the wall with a long masonry drill. See the diagram in 5 below. 4 If you are using a core drill, drill both the high hot air flow hole (and the low cool air flow hole) halfway through the wall(s) on each side and skip the next 2 steps. 5 You can make a large hole by drilling many small holes around the edge of a circle, it is important that each of these holes are perpendicular to the wall so that the hole is round on both sides of the wall. 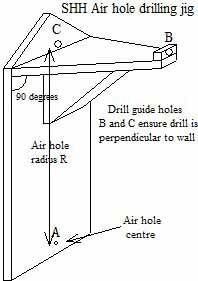 To ensure the hole is perpendicular you could make and use a simple wooden drilling jig, shown below, to enable many holes to be drilled perpendicular to the wall of the required air hole radius R through the wall. This jig can also be used the drill the holes around the circumference of the air hole in a circle using two masonry drills, one twice the diameter of the other. Loosely screw the drill jig to the wall through hole A using a screw and a rawplug so that the jig can be rotated when required later. Drill small diameter (5.5 or 6mm) holes just over twice the small drill diameter apart just over half way through the wall. Than enlarge each using the larger diameter drill. Then go to the other side of the wall and repeat the process. Once you have the holes drilled you can drill some extra holes within the air hole circle to remove small parts one at a time. Smooth the edges of the air hole using a stone chisel and hammer. 6 Repeat the relevant steps above to drill the return air hole as required. 7 The controller will be connected to the conservatory and room temperature sensor and the fan cables, these will enter the controller from the rear righthand side and connect to the internal controller connectors J5, J6 and J8 respectively on the right side of the printed circuit board. Make room in the wall immediately behind the controller location for the cables. 8 We recommend that the Attic Heat Harvester 230vac power be fed via a separate fused (2 amp) isolating switch which is generally located by the side or beneath the controller. 9 Make mounting holes in the wall for raw plugs to mount the controller (these 4 holes are 95mm apart), the fused power switch, the fan mounting board, and the gravity shutter(s). 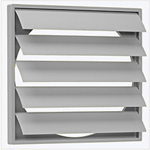 11 Remove the gravity shutter louvres and carefully store them with their spigots, refit these at the end of the installation and commissioning process. Temporarily assemble the fan, the fan mounting plate if one is to be used, the fan diameter adaptor, and a length of plastic pipe. If the plastic pipe diameter is a little too small for the adaptor cut a few short slots along the pipe at one end permitting it to be splayed to overlap the adaptor by some 10mm, mark the overlap on the adaptor and the top position of the pipe and adaptor. Temporarily fit the assembly through the hot air hole and hold or tape it in place. The plastic pipe should exit the wall in the room side, place the gravity shutter over the plastic pipe and mark a cutting line on the pipe. Disassemble the parts and cut the pipe to the required length. Reassemble the parts except for the fan (and fan mounting plate). Secure the adaptor and pipe using aluminium foil tape available from Screwfix. 12 If your system has a return cool air hole to the conservatory repeat the above process using the gravity shutter, a pipe and an air vent if one is to be used. Fit the pipe, gravity shutter and air vent to the cool air hole. 13 Pass the fan power and conservatory temperature sensor cables from the fan location to the back of the controller location, these may be able to be passed down the wall cavity . If you wish to hide some controller system cables in the wall, make channels for them, alternatively you can use self-adhesive mini trunking (available from Screwfix) to hide the cables. 14 Make a hole for the conservatory temperature sensor cable in the wall or the mounting plate by the side of the fan ensuring that it cannot be sucked into the fan, then fit the fan-(mounting plate)-(adaptor)-pipe assembly after connecting the fan power cable to the conservatory wall. 15 The solar heat harvester room temperature sensor should be located in the same area as the return air hole and approximately 1m from the floor. If there is no return air hole run this sensor cable to a cooler area of your home where the heated air can reach. Run the room temperature cable from the sensor location to the back of the controller. 16 Fit the gravity shutter(s) on the wall air exit sides of the air holes and refit the louvres. 17 Carefully remove the front of the Attic Heat Harvester controller by loosening the four black corner screws, then move it just forward enough to carefully disconnect the 4 way connector to the front panel mounted keypad by wiggling it side to side and put the front panel aside. 18 Fit the controller and fused power switch to the wall after carefully checking that all system connections comply with the wiring diagram. 19 Connect the controller cables and the 230vac power cables as shown in the wiring diagram above. 2 Temporarily disconnect the controller 4 way connector J8 for the initial test. 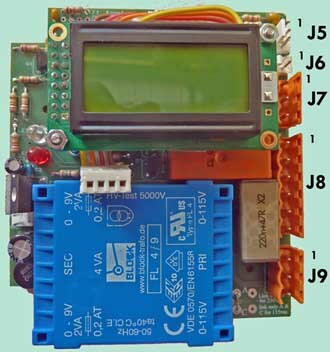 Only the conservatory temperature sensor J5, room sensor J6, and main power J9, connectors should be connected. 4 If the controller is connected correctly the green Power On LED should turn on, the display back light will turn on for 1 minute and the yellow LED (top left) should blink every second. The LCD display will sequentially display the 'Sign On' messages, the 'firmware version number', then the controller will perform a self-test displaying any problems seen. If there are no problems the Current Time will be displayed as 0:00 giving you the option for 20 seconds of setting the time using the + and – keys, - this process can be aborted by pressing the front panel Mode key, then the current conservatory and room temperatures will be displayed. 5 If problems are detected with the 230vac supply voltage or with the temperature sensors they will be displayed and you should consult the Attic Heat Harvester Controller Manual section 4 Systems Tests for help. To select the controller 'built in test features' the front panel keypad will need to be connected. Problems need to be rectified before you can proceed to the next step. 6 Turn OFF power to the system. 7 Connect the 4 way connector J8. If a 6 way connector had been fitted to J8 position connect the 4 way connector to the bottom 4 pins 3 to 6. 8 Carefully refit the front panel by connecting the 4 way connector ensuring that the yellow wire is at the left side. 9 Turn ON power to the system. 10 When the controller has completed it's initial system tests the conservatory and room temperatures will be displayed. 11 When the controller is displaying temperatures and the fan is running you can check that the fan experiences minimal backpressure. Open the door connecting your home to the conservatory, then press both the controller 'MODE' and '+' keys together simultaneously for a very short time and the display will change. After a few seconds the fan speed will increase to a maximum and the gravity / backdraught shutters will open as much as they can. Note the position of the shutters then close the conservatory door, if the fan noise changes or the shutter louvres close significantly the fan will be experiencing back pressure as insufficient air is returning to the conservatory. You need to resolve this if possible to get the best from your system and to make the controller calculated performance figures correct. 12 If you wish to check your fan airflow so that your system performance calculations are accurate you can obtain an anemometer from Amazon or RS Components. In normal operation, when room and conservatory temperatures permit, the fan / blower will turn on after a short delay. The Attic Heat Harvester Controller has many user set parameters that enable you to configure the system to suit your installation, the system components you have used, and your preferences See section 3 Parameter Setting mode. Enjoy your Solar Space Heating System and the heating cost savings you will have in all your future years. Please tell your friends about it. Thank you for helping future generations of mankind by reducing your carbon footprint. To get the best from your system may we suggest you read and become familiar with the Attic Heat Harvester Controller Manual.